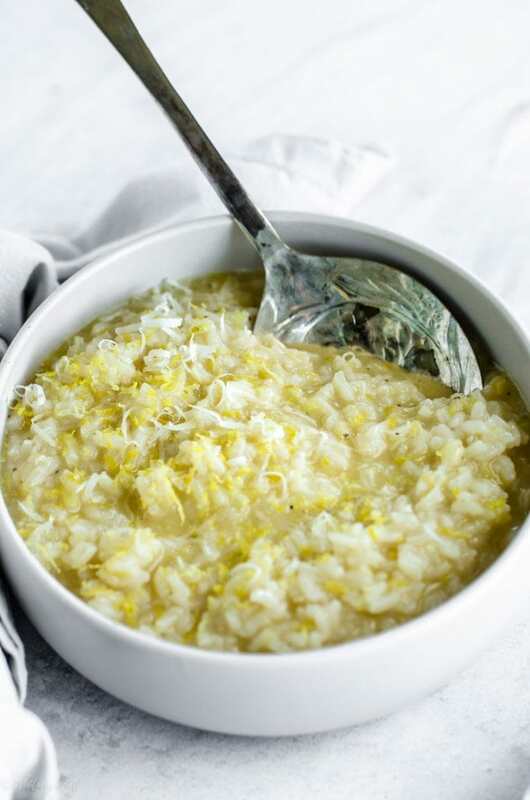 If you are looking for creamy comfort food that is easy to make but tastes like it was made in a fancy restaurant, this Springtime Lemon Risotto has you covered! 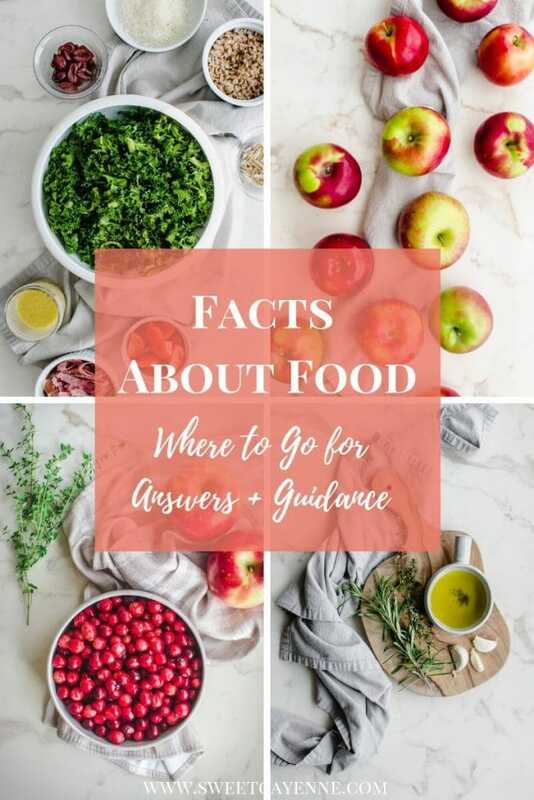 A question I get asked quite often is “what is your favorite thing to cook?” And I’m always a little embarassed to answer because, the truth is, I don’t really have a favorite thing to cook. I just like to cook in general! I’m always trying new types of recipes and cooking techniques, and there aren’t many things I make on a regular basis just because it’s a favorite dish. BUT….I think I now have an answer: risotto is a favorite thing I like to cook! 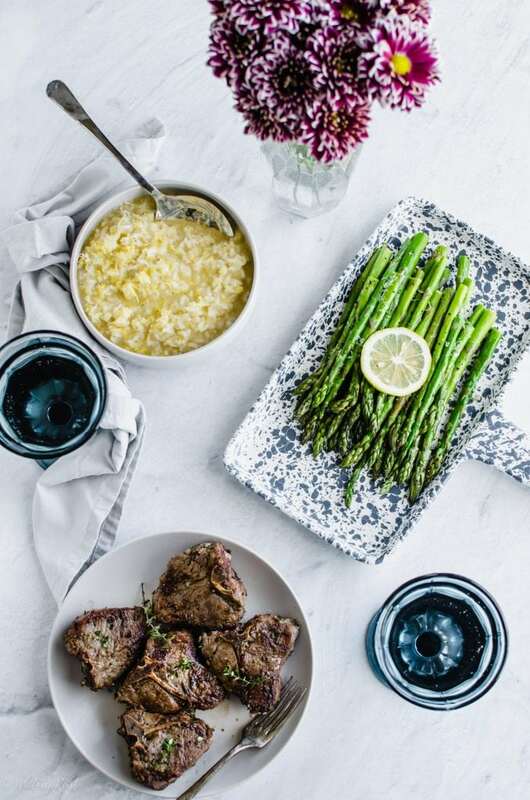 I came to this realization this past Valentine’s Day when I made the exact menu I’m sharing with you this week: roasted asparagus, lamb chops, and lemon risotto. Ryan and I LOVED this dinner and I knew I needed to share exactly what we made that night because everything just worked so well. The risotto in particular was really fun to make, as you really just stand there and stir stock into the rice as it cooks. It’s a dish that allows you to just chill and hang out with someone as you make it, have good conversation, and enjoy the process of cooking together! Arborio or short grain white rice is a must – that is, if you want traditional risotto. Sure, there are recipes out there for farro risotto, barley risotto, and probably cauliflower “risotto.” But you will really be doing yourself a favor if you try the traditional Italian version with arborio rice. It may be labeled “short grain” rice, and you can tell by the small, oval shaped grain that has a concentrated white patch of starch in the middle. This type of rice is high in starch that swells and gets rich and creamy when it’s cooked slowly and stirred throughout the cooking process. Your stock needs to be warm – if you want your risotto to cook evenly and be piping hot when you serve it, heat your stock in a small saucepan before starting to make the risotto. Keep it warm throughout the process of adding it to the rice. Stepping away for a minute or two isn’t a deal breaker – I know, risotto is known for requiring you to stand over it and stir the whole time it cooks. And while a lot of stirring is necessary, your risotto will turn out fine if you need to take a minute or two to put something in the oven or grab a drink. Just add your ladle of stock before you step away, then stir it in when you return to the risotto. 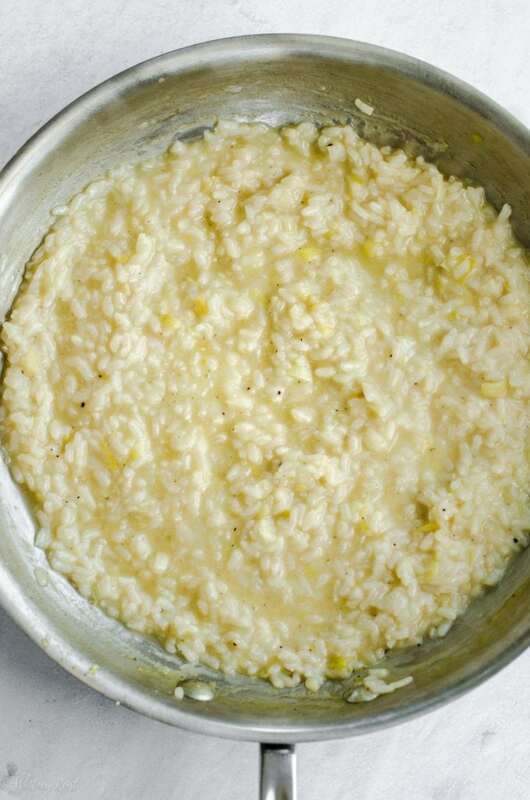 Taste for texture – after about 20-25 minutes of cooking, you want to taste your risotto to assess the texture. The rice should be tender to the bite but not mushy. The overall texture should be creamy with a medium thickness – not runny, but not so thick that it all sticks together in a mound. Aromatics – traditional risotto uses a bit of finely chopped onion that is cooked until tender and translucent to give the dish flavor. Feel free to substitute shallots or leeks for this – I’ve used both because I prefer a milder flavor and loved the results! Just be sure to avoid getting color on the aromatics – you don’t want to brown them, just sweat them to help tenderize before adding the rice. Wine – a good, dry white wine will work best here. Nothing too fruity and definitely not sweet, unless you are making chocolate risotto (which is a thing!). Stock – you can use veggie, fish, or chicken stock, depending on the mix-ins you are adding and the final flavor you want. Just be sure to use a good quality stock that you enjoy the flavor of on its own – bonus points if you have homemade on hand to use! Mix-ins – this springtime risotto keeps it simple and seasonal with the addition of fresh lemon juice, zest, and finely-grated Parmesan cheese. In the past, I’ve added chopped roasted asparagus, seafood, mushrooms, artichokes – feel free to get creative! You will fold in mix-ins once the risotto is finished; right before serving. This lemon risotto pairs perfectly with my spring dinner party menu of roasted asparagus, lamb chops, and this fresh lime tart with blackberry sauce – enjoy! Are you ready to try this Springtime Lemon Risotto? I’m so excited for you to try this recipe! 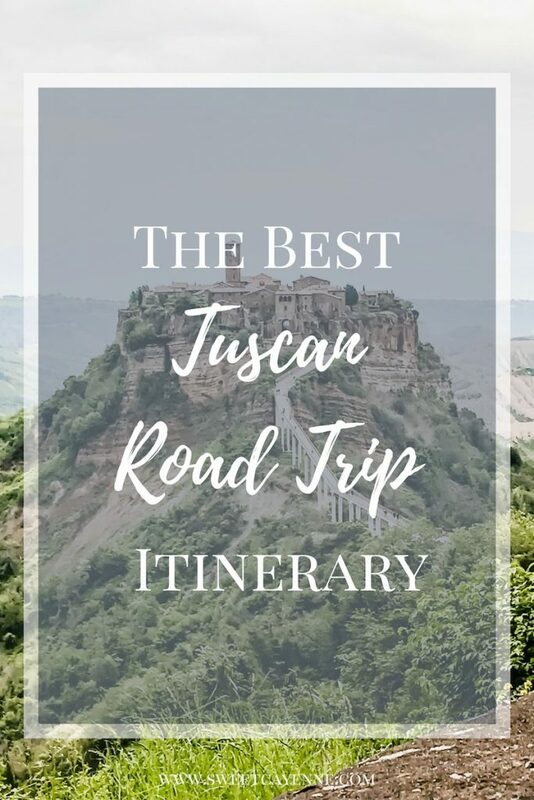 Once you get the chance to make it, please let me know how it turns out for you! Leave a comment and rate the recipe below. This will help me with the creation of future recipes. 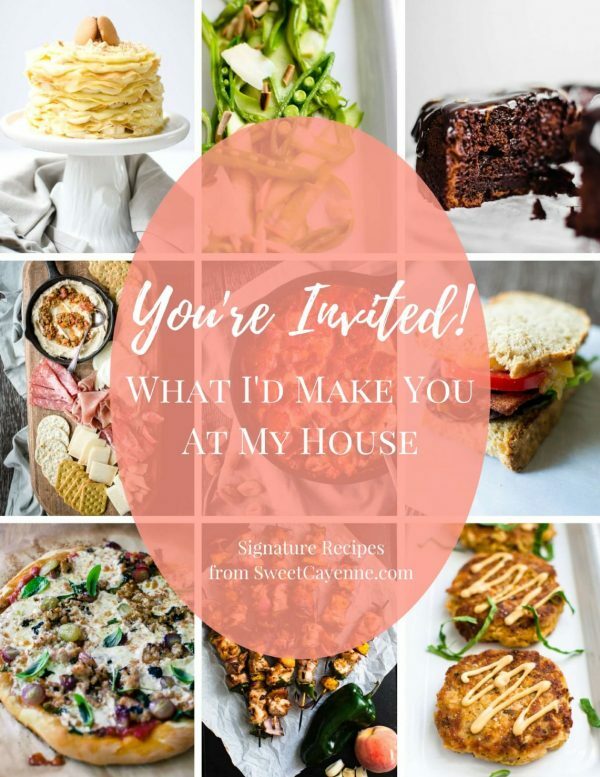 I’d also love to feature your creation in my monthly newsletter, so you can upload a photo to Instagram or Twitter with the tag @sweetcayenne5 to be featured! Place the chicken stock in a saucepan over medium-low heat with a ladle nearby. Place a large skillet over medium-low heat. Add the butter and olive oil. Once the butter has melted, add the leeks. Saute until the leeks are soft and translucent, about 5 minutes. Add the rice and stir to combine. Add the wine, and stir continuously until the wine is absorbed. Add one ladle of the chicken stock to the rice. Stir slowly until the stock has almost completely been absorbed before adding another ladle. Repeat this process ladle by ladle until the rice is tender and al dente. This should take about 30 minutes, and you can start tasting to assess the texture at the 25 minute mark. The final texture of the risotto should be creamy and loose to the point where when you pull a spoon through the center, it fills back in within a few seconds (think the texture of a silky stovetop mac and cheese). Once the risotto is finished, turn off the heat and stir in the lemon juice and zest. Stir in the Parmesan and add salt and pepper to taste. Serve immediately. Store leftovers in the fridge up to 5 days. To reheat, put a serving in the microwave with ¼ cup chicken stock or water on top. Microwave 2 minutes at 80% power, stir, then heat an additional minute. Alternatively, you can use leftover risotto to make arancini, which are fried risotto balls!